Welcome To Webs-Index.A blog meant for sharing about Islam and other beliefs and also to provide important Web-links and News . Dear Christian's Please Ask Yourself ? Do Muslims Celebrate Easter and Christmas? The Best Mail of the Year. Allah taugth us,"How we should do Prayer (dua0"
The Best Hours of the Day- Fajr and Asr. Will Islamic banks become the rivals of Rothschild and the banks of USA and EU? DNA testing on Bin Laden? "It takes less mental effort to condemn than to think." We Have Inserted Pay Per Clicks Ads For Funding Support. If You Find Them Useful DO Visit Them To Support Us.We May Not Comply With What Is Displayed. 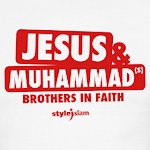 John 8:58 didn't say "I AM"
Jesus used the word "Muslim" in Luke 6:40. Order a Free Noble Quran. !.Or get a hard copy. Discover Islam in all World's Languages.. ! Muslims Beats their Wives ?? ?